Drug War Facts | Knowledge is power. Have any questions? DWF Editor Doug McVay is available to help. Use this link to email Doug your questions. "A critical resource for anyone seeking accurate information on drug policy... essential!" "Drug War Facts is one of the most valuable sources of information about drugs anywhere in the world. It's a must-read." "Incredible resource for preparing for debates, writing op-eds, and fact checking. Meticulously sourced." "I want you to know that when we're not producing Hempfest, we are reading Drug War Facts, one of the best compilations of data and raw information to fight the power that exists." "A compendium of facts that fly in the face of accepted wisdom." "Drug War Facts offers a treasure trove for serious seekers of useful facts and sources about all sides of the drug war." "A valuable resource for anyone concerned with drug policy." 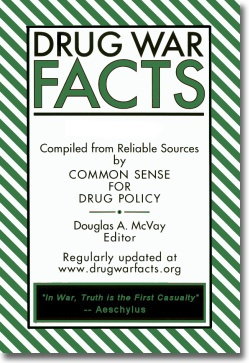 Since it first went online in 1998, Drug War Facts provides reliable information with applicable citations on important public health and criminal justice issues. It is updated continuously by its current Editor, Doug McVay. Drug War Facts is sponsored by Common Sense for Drug Policy. Its directors are Kevin B. Zeese, President; Ernest Drucker, Ph.D., Chair; Robert E. Field, Co-Chair; Melvin R. Allen, JD; David Borden; Balázs Denés, JD; Kris Krane; and Doug McVay. To the extent of its copyrights, Common Sense for Drug Policy authorizes and encourages the use and republication of some or all portions of this book. Questions, comments or suggestions for additions and modifications are most welcome and may be addressed to Doug McVay at dmcvay@drugwarfacts.org. Click here for a list of chapters.